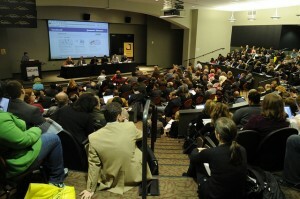 We are beginning to put up photos and content from our SoCon11, social media conference. 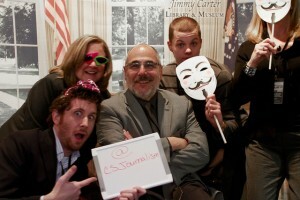 You’ll find some fun photos from our 5th Anniversary networking party, including this shot of our Center for Sustainable Journalism folks who put on the conference, including from left Noah Echols, Ellen Miller, Leonard Witt, Clay Duda and a masked Carole Arnold. As you will see from the photo from Saturday, we again packed more than 300 attendees into the Social Science Building auditorium at Kennesaw State University. See what the #SoCon11 tweeters said here. Here are the slide shows of some of the Power Point presentations. Watch for more content coming up soon. If you attended and want to use a photo for your blog or newsletter, feel free. Thanks to everyone from our staff to the more than 25 presenters to the 300 plus attendees for making it a wonderful 1.5 days of learning, sharing and networking. See you next year at SoCon12. This entry was posted on Tuesday, February 8th, 2011 at 3:03 pm	and is filed under Uncategorized. You can follow any responses to this entry through the RSS 2.0 feed. Both comments and pings are currently closed.